After weeks of uncertainty and a highly publicized fight in the Senate, President Obama signed an emergency six-month extension of unemployment benefits into law last Thursday. The law extends unemployment insurance benefits for about 2.5 million unemployed individuals since the last extension expired on June 2. The new emergency extension applies to people who have been unemployed for 26 weeks, which is approximately half of all the unemployed in the country. Benefits will be extended for up to 99 weeks, with the precise length of the extension varying by state in accordance with statewide unemployment rates. In states like Nebraska, with a relatively low unemployment rate of 5%, the extension will expire after 60 weeks, whereas in states like Michigan, with unemployment hovering around 13%, residents will be eligible to receive the full 99 week extension. States pay for the first 26 weeks of unemployment benefits, and legislation passed last week renews a federal program that funds the additional benefits for states mired in high unemployment. Arguments for and against passing the latest unemployment insurance extension fell along predictable partisan lines. Most Democrats, with the exception of the usual suspects balking at caucus priorities, argued that benefits provide critical support for unemployed individuals as well as important stimulus to a still struggling economy. 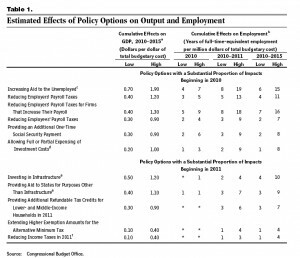 In terms of bang-for-your-buck, they argued, unemployment benefits produce the most economic boost of any proposed stimulus measures. Republicans, claiming they supported the extension while filibustering the vote, believed that an emergency extension was too costly, with some also contending that unemployment benefits offer an incentive for people not to find jobs. Consumer spending accounts for over two-thirds of the nations’ economic output. Middle and especially low-income consumers are the best kind of consumer because they are less likely to save and immediately spend their paychecks right back into the economy. Unemployment benefits, at best a stopgap measure to prevent spending power from reaching zero, are immediately spent on groceries, housing and other necessities. Without the ability of the consumer to spend, the economy slows, causing further drops in employment and a continued downward spiral. 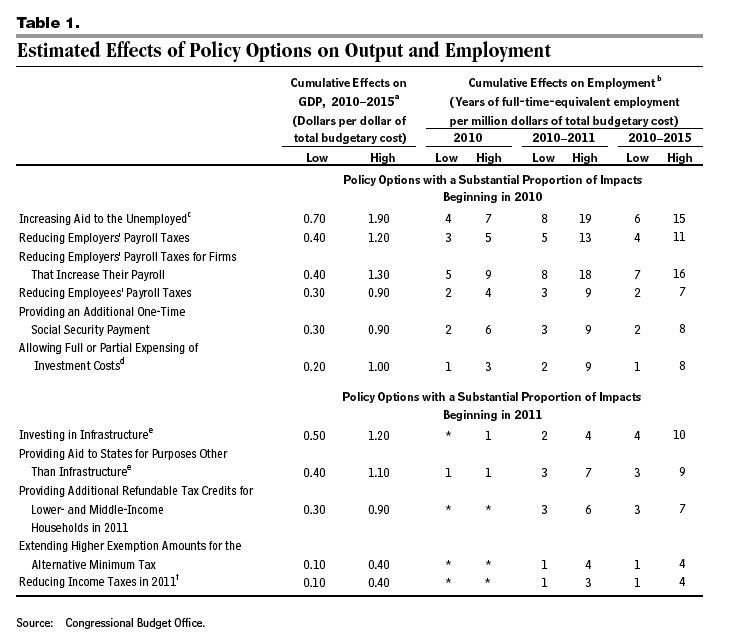 The claim that unemployment benefits create an incentive for people not to work makes several assumptions: that the benefits are significant, that those receiving benefits get them for nothing, and that there are actually jobs to be had. The average unemployment benefit is around $300 per week. Although benefit amounts vary by state, an unemployment check generally amounts to about one third of the unemployed person’s previous earnings. It is difficult to imagine a family happily living off of one third or less of its normal income and just frittering away the time as their savings are depleted. Even if living off of an extremely limited income were an attractive alternative, looking for work and submitting proof of a job search is a requirement for receiving unemployment benefits. Finally, there is the issue of the availability of the jobs themselves. Last month, private sector employers added only 41,000 jobs; 72,000 fewer than are needed just to keep up with the number of new workers entering the job market. There is some evidence to suggest that the rate of individuals returning to the ranks of the employed is greater during the final weeks of benefit availability. But, economists argue, this behavior does not apply during prolonged periods of low job availability. Also, much of that data was acquired during the 70s and early 80s, when companies would time temporary layoffs to coincide with the expiration of unemployment benefits. According to Andrew Stettner, deputy director of the National Employment Law Project, with five people trying to find work for every one available job, the incentive argument does not hold water. Talking points are funny things, with the ability to grow legs and run a marathon through the media regardless of their connection to reality and the workings of the world in which we actually live. And for seven weeks, while politicians postured, 2.5 million people wondered how they would make ends meet in an economy still offering few job possibilities. With the economy looking to remain weak in the coming months, these debates, about the nature and effectiveness of various types of deficit spending, are likely to continue to take center stage in Congress. 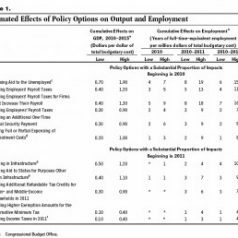 The debate over whether or not to extend unemployment benefits is illustrative of a larger issue confronting policy makers: the need to create jobs and continue to stimulate the economy. And the rhetoric of the debate also brought to the spotlight some intentional distortions of facts about short-term deficit spending and long-term budgetary concerns, as lawmakers played on the fears of an already weary populace by presenting the rising specter of an imminently bankrupt country. These recently formed anti-deficit contingencies ignore the distinction between different types of deficit spending and the impact this spending has on the overall economic health of the country. In part, this is somewhat understandable. The sound bite, he said/she said oriented media environment does not lend itself to the thorough explanation of nuanced policy. 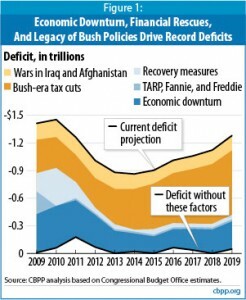 But, more often, arguments are misleading and facts are distorted because concerns being raised about deficits are politically motivated rather than based on any real analysis of solutions for a stagnant jobs market and a shaky recovery. In terms of economic actuality, there are a limited number of things that can boost GDP and fuel a more robust recovery. Consumers can spend money, businesses can spend money, investments can produce payoffs or the government can spend money. Consumers, fearful about high unemployment and faced with decades of stagnant wages and accumulated debt, are holding back on spending. Businesses, cautious due to lackluster consumer spending, are holding off on hiring and other forms of consumption. Investments, although recovered somewhat, still remain relatively flat. That leaves government spending. Choosing this moment to start using deficits as a political tool works against the one variable that can still be employed quickly to give the economy the capital it needs to recover. As stimulus money gets pared down and job bills shrink, the economy continues to be held hostage to political calculations. Democrats might not be willing to counter the recently discovered anti-deficit fervor with a call for more short-term stimulus spending, fearful of being labeled as deficit creating, free spending liberals. But if they do nothing, and the economy remains stagnant and unemployment high, they will be faced with electoral defeats and an inability to implement any new initiatives. A “jobless” recovery and weak consumer spending will keep tax receipts low and deficits high, thwarting future projects. Republicans, who would like to keep cutting taxes and funding wars (yes, the Democrats are culpable here, too) may find that they have created an anti-deficit movement that undermines popular support for extending the Bush tax cuts and continue emergency appropriations for military expenditures. And, even if they do succeed in extending the cuts, they will be responsible for increasing long-term deficits. No matter what the ideology behind the politics, a failure to seriously address unemployment and to work for stronger economic growth is dangerous to everyone. We all need an end to disingenuous arguments and fear mongering and a real look at how we can seriously address economic and deficit challenges.